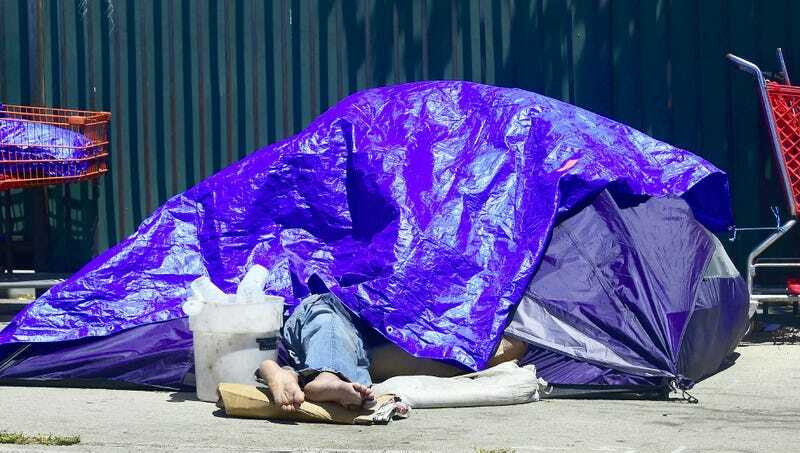 Over half a million people in the U.S. experience homelessness on an average night, and the circumstances of homelessness are often misunderstood by elected officials and the general public. The Onion looks at some of the common myths about homelessness. MYTH: It’s expensive to house the homeless. FACT: Our prison system is quite profitable. MYTH: The homeless spend their money on drugs and alcohol. FACT: You also do that. MYTH: People think the homeless are a bunch of drug addicts uninterested in improving their lot in life. FACT: True, our society does lack empathy. MYTH: Homeless people don’t want jobs. FACT: Nobody wants a job. MYTH: Homeless people can make hundreds of dollars a day panhandling. FACT: Almost all of that money goes to the IRS due to panhandlers’ tax status as independent contractors. MYTH: The homeless epidemic disproportionally affects people of color, disabled people, and veterans. FACT: Sure, if you’re going to cherry-pick. MYTH: Homeless people are often mentally unstable and can be a danger to themselves and others. FACT: You’re thinking of the incredibly wealthy. MYTH: The homeless community can just take care of each other. FACT: If that’s what helps you sleep at night.